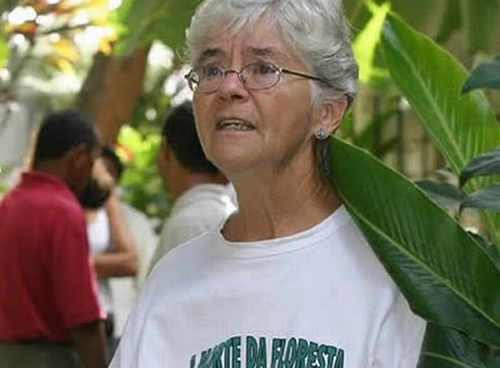 RIO DE JANEIRO, Aug 23 2012 (IPS) - The release from prison of the Brazilian rancher found guilty of ordering the 2005 murder of U.S.-born rainforest activist and nun Dorothy Stang has alarmed human rights defenders, who warn that it could set a dangerous precedent in other cases involving land disputes and the rights of poor farmers. Late Tuesday, Brazil’s Supreme Court ruled that the rancher, Regivaldo Pereira Galvão, had the right to remain free pending the outcome of his appeal. Galvão, who was released from prison Wednesday in Altamira, a city in the northern state of Pará, was arrested in 2008 and sentenced to 30 years in April 2010. But he was freed after sentencing, when his lawyers filed an appeal. A year later he was jailed again, however, when a state court ruled that he had to begin serving his sentence before the appeal process was finished. “I don’t understand what prompted the Supreme Court magistrates to decide that there were no risks,” Aton Fon Filho, one of the attorneys for the plaintiffs, representing the Catholic Pastoral Land Commission (CPT), told IPS. Moreover, “the confirmation of his responsibility for Stang’s death was accompanied by attitudes that kept up the state of tension in the area around Anapú (where she was killed). He continued to threaten local residents and the members of the sustainable development project that she created,” he said. Stang was shot on Feb. 12, 2005 near Anapú, a small Amazon jungle village where she was active for 23 years, helping local peasant farmers fight for their land and their rights in the face of encroachment by large landowners and logging companies. Four other people were found guilty of the murder, including another rancher, Vitalmiro Moura, who is serving a 30-year sentence. The 73-year-old Stang lived in the Amazon jungle for three decades, working to preserve the rainforest and defend the right to land of the poorest farmers. When she was shot – six times at point blank range – she was only carrying a Bible. According to the prosecution, she was killed because of her constant campaigning against slave labour in the area. The lawyer stressed that a recent federal police investigation found signs that some provincial police officers in Pará were involved with landowners in committing crimes and issuing death threats. After Pereira Galvão was imprisoned, the threats and tension had diminished, Fon Filho said. Santoro also noted that Roniery Lopes, a witness who was going to testify against Pereira Galvão in a fraud case, was murdered in 2009 before he could give his testimony. The message is that “not even in a case that had such a huge international impact…can the Brazilian justice system manage to give a quick response that guarantees the safety of human rights defenders,” Santoro said. Stang’s death was not an isolated incident in Brazil, where rural violence is rampant. The CPT gave the president’s Human Rights Secretariat a list of names of 1,855 people who have received death threats because of land conflicts nationwide. The most violent states are Pará and Maranhão, and minorities like indigenous people and blacks living in quilombos – isolated rural villages founded by escaped slaves – are the most vulnerable, according to the organisation, which is linked to Brazil’s national bishops’ conference. The CPT reported that more than 1,500 peasants have been killed in land conflicts over the last two decades. Nearly all of the murders have gone unpunished. There is special concern about the situation in Maranhão, in northeast Brazil, where quilombo communities receive constant threats from local landowners. The authorities have promised to protect community leaders living under death threats, but nothing has been done, according to the human rights watchdog. “Forty-five families from the Quilombo Pontes community in Pirapemas, Maranhão state, Brazil, are being systematically threatened and intimidated by gunmen who are patrolling the area,” says an urgent action alert issued by Amnesty International Wednesday. “The gunmen have been employed by local ranchers who are trying to push the community off the land. The community’s crops and property have been destroyed and its members are struggling to provide food for their families,” it adds. Fon Filho and Santoro also called attention to the situation of a community of Guarani-Kaiowa Indians in the southwest state of Mato Grosso do Sul, who had occupied land to protest the delay in the process of officially demarcating their territory. In November 2011, 40 armed men attacked one of their camps, killing a community leader and injuring several other people. “We haven’t heard of government measures to bring about the disarmament of these landowners,” Fon Filho said. He added that special protection measures are always adopted after someone is murdered, instead of preventively, as required in these cases.